What if we could explore far off corners of the world just like the famous luck dragon Falkor in the classic book and movie The Neverending Story? The Schmidt Ocean Institute launched the R/V Falkor to do just that. 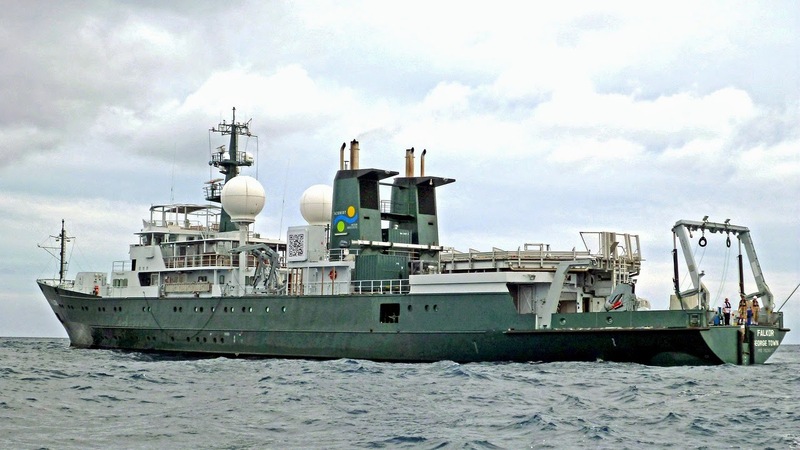 Funded by Google's deep pockets, this private research ship is charged with exploring uncharted depths of the sea and offers scientists competitive opportunities to conduct their own research expeditions along the way. Since we know more about the surface of the Moon and Mars than we do our own ocean, this is a very timely mission. All data collected on the Falkor is made freely available to the public in order to best advance knowledge about the regions it explores. I have had the good fortune to take part in two cruises aboard the Falkor. 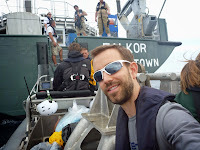 Last month, I participated in a short 3-day training cruise to the Maui Nui area, and now I am one week into a 36-day cruise to map the Papahānaumokuākea Marine National Monument (PMNM) (aka: Northwestern Hawaiian Islands). The World Heritage Site, which is larger than all U.S. national parks combined, encompasses unique biological, geological, and cultural wonders that have barely been explored. The vast area is triple the length of the main Hawaiian Island chain, and would stretch from New Orleans to Los Angeles if you overlaid it across the U.S. Very few high resolution multibeam mapping surveys have been undertaken in the PMNM, leaving gaps in our knowledge about the seafloor there. We are here to fill in as many of the blank areas as we can using the Falkor's state-of-the-art multibeam sonar mapping systems. Follow us on journey here. Besides advancing scientific knowledge, Google's interest in the project is to use the newly collected data to enhance its Google Ocean features within Google Earth. 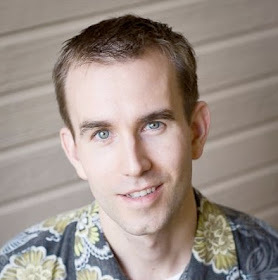 To achieve this objective they partnered with the University of Hawaii to plan and carry out the mapping operation to optimize science return. We took the opportunity to also bring a gravimeter and magnetometer to collect geophysical data along with the mapping information. This provides an unprecedented opportunity to help unravel the geologic history of the region by helping us understand what is beneath the surface. The eleven scientists and students on the cruise have broken up the day into three 8-hour blocks, during which we serve as watchstanders to ensure the mapping and geophysical systems are all operating properly. 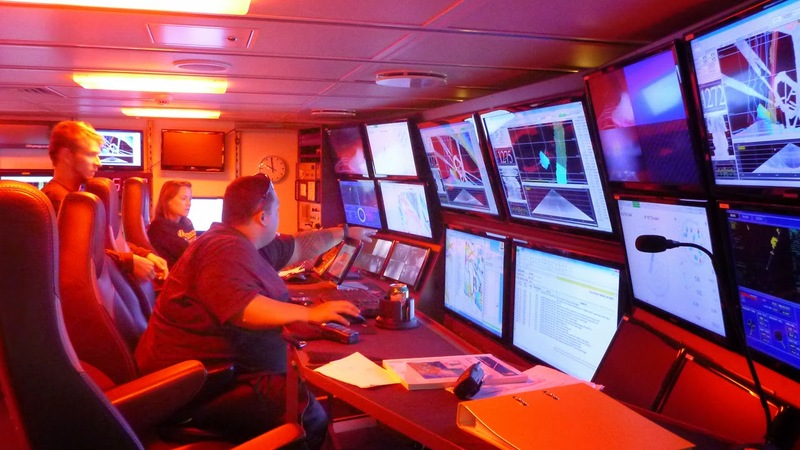 We continuously plan the ship's route and modify the plan as we go depending on where the holes in existing data are, what subsurface targets are of most interest, weather conditions, and how much time we have. It requires a balancing of priorities and making decisions on the fly to achieve the expedition's goals. Since this is a national monument, we must be extra careful not to interfere with wildlife, so we take turns standing watch on the ship's upper "monkey deck" from sunrise to sunset to watch out for marine mammals. We have already seen pilot whales, sperm whales, and bottlenose dolphins. Life on the Falkor is very nice. It’s stylish and homey, with a decor that looks like something out of an IKEA catalog. There are several amenities like a gym, sauna, and outdoor lounge. The crew is very friendly, and we have had several social get-togethers like barbeques, movie nights, and a ping pong tournament. The scientists also give seminars on various topics twice per week; I'll be giving one about tsunami warning later in the cruise. By far, the best thing about life on board is the food. Every meal is cooked by gourmet chefs and is among the best food I have ever eaten. You can see for yourself by touring the ship virtually via Google Street View on the Falkor’s website. 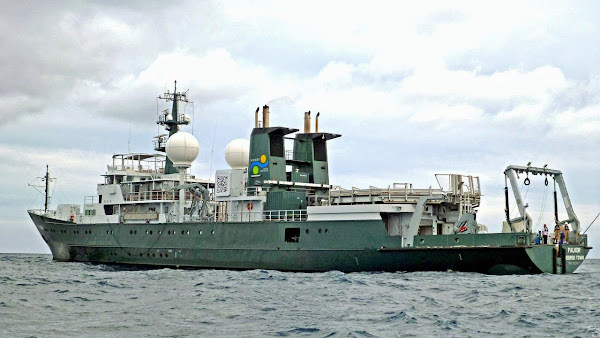 The Falkor is similar in many respects to the NOAA Ship Okeanos Explorer, where I participated in a 15-day mapping cruise from Guam to Hawaii back in 2010. The two ships have similar exploration missions and capabilities. For example, they both use the Kongsberg EM302 multibeam mapping system, although the Falkor also has a high resolution EM710 system too. Both ships share the same spirit of discovery to unravel the mysteries of the deep. I am honored to have had the privilege to sail on both of them.